[SatNews] SES ASTRA and Italian integrator Digitaria are creating a nationwide energy monitoring system using Newtec’s Sat3Play® technology for connecting remote sites. This SCADA (Supervisory Control and Data Acquisition) system will connect about 5,000 renewable energy plants over satellite links to provide a sophisticated monitoring and forecasting capability for Italy’s gas and electricity authority. Interactive satellite broadband links, provided by SES ASTRA via the ASTRA2Connect service with the Sat3Play hubs and low-cost, easy-to-install terminals at the remote sites, allow the system to collect data from wind, hydro-electric and solar plants through telemetry and video surveillance. You can learn more about Sat3Play here. The system monitors data on power generation from each plant, as well as environmental conditions including wind speed, temperature, humidity, pressure and solar radiation. The collected data is then integrated with the forecasting system to provide an accurate basis for combining the energy generated with the national grid. Under overall control of the government agency GSE (Gestore dei Servizi Energetici), the project is managed by a consortium of SES ASTRA; Digitaria, the ASTRA2Connect service distributor in Italy; and Calzavara, a system integrator specializing in telecommunications, with extensive experience in serving the renewable and alternative energy sectors. 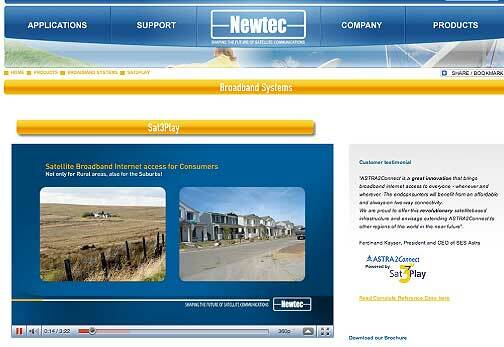 “The European energy market is seeking a substantially increased share of renewable energy sources, and we are very proud to offer ASTRA2Connect as a reliable and cost-efficient solution, powered by Newtec Sat3Play, that’s ready for the enterprise market,” says Patrick Biewer, Managing Director of ASTRA Broadband Services, SES ASTRA’s broadband subsidiary. The complete solution comprises the supply, installation, management and maintenance of all the elements necessary for the implementation of a satellite-based metering system, and it operates entirely independent of terrestrial communications services. The system’s highly flexible architecture allows the easy and quick addition of extra units and provides extremely high reliability, thanks to built-in redundancy of the transmission infrastructure.